Upper Hull Side: Shows the hull side just below the main deck. 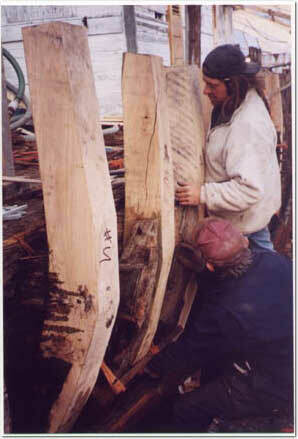 Each frame consists of twin timbers 6 inches thick and about 8 inches deep at the main deck. The foreward futtock at each frame extends 24 inches above the main deck to create the stanchion for the bulwark sides which protect the crew. 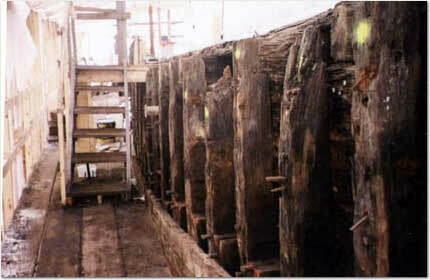 The aftward upper futtock (“top timber”) at each frame is longer and staggered at its lower end for strength. Both the stanchion futtock and the top timber will be replaced. Runs of 6 inch by 3 inch planking can be seen near the scaffold floor boards. The four largest planks have been removed. All of the frames and outside planking are white oak. The inside planking is long leaf yellow pine. Some locust trunnels can be seek sticking out of the frames. They originally fastened the outside planking. 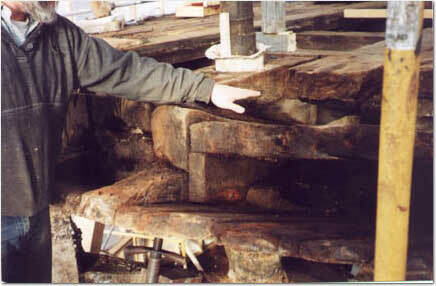 Fitting Stanchions: Shipwrights are positioning stanchion futtocks near the stern. Each is cut from white oak, painted with Cuprinol, and bedded on a tarred futtock base to prevent rot from being transmitted from one futtock section to the next. Cutting Old Top Timber: Soon after the stanchion is put in place and secured with clamps, the adjacent top timber can be removed. 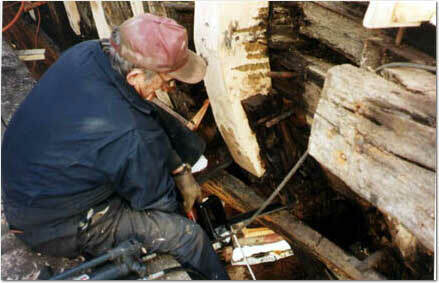 The shipwright can be seen using a power saw to cut away rotted top timber. Cutting levels extended down to sound futtock timber and varied by frame. Horn Timber End: The extreme aft end of the tug has no keel because the hull rises to make way for the propeller and rudder below. Instead, the lower support and centerline structure is the horn timber, which measures 12 feet long, 14 inches deep and 12 inches wide. The horn timber is the large centerline timber seen here. It extends aft from the stern post, which is just forward of the propeller. On either side of the horn timber are featherboards that help the planks fasten to the centerline. The end of the horn timber is notched to support the 12-inch thick rim timbers that form the outside edge of the tug’s eliptical stern structure. The featherboards are notched on their outboard surfaces to receive the framing. 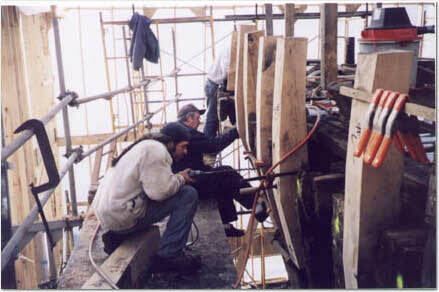 Outboard of the featherboards, a series of “nailer” pieces were installed between the frames to add strength and stability and help hold and separate the inner ceiling planking and outer hull planking. The outside and inside hull planking can be seen. Drilling a Stanchion: After a stanchion futtock is positioned, it is secured by drilling holes through the futtock, inner planking, and clamp timber and driving a slightly oversized drift through the hull. Here the shipwright is sighting through the structure to align his drill bit. The drift is secured by beating its ends over clench rings (essentially galvanized shaped washers), to hold the assembly tight. The outboard clenching is set into countersunk holes. The inboard clenching is on the surface of the ceiling planking.